One of the most exciting projects that we could imagine is helping with a new ministry school in San Gil, Colombia. It is the heart of the Colombian church to plant many churches throughout the country, and especially, in Santander. However, in order to start churches, pastors and ministry leaders are needed. 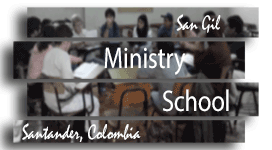 In order to meet the need, a new ministry training school will be started in San Gil. We are looking forward to starting this in 2017 with approximately 40 students. This number is expected to grow rapidly. Join us in prayer for this new venture, and check back here for new details.